Last week’s announcement that Fox is developing a sequel to Mrs. Doubtfire garnered surprise even from its former cast, who wondered what reason there could be to mount a follow-up 21 years later—besides the need to reuse Robin Williams’ prosthetics, made from ground-up Bengal tigers, at least once, else it’s a shameful waste. But today brings one possible explanation: Mrs. Doubtfire was the most-aired movie on basic cable in 2013, playing 66 times across five networks. 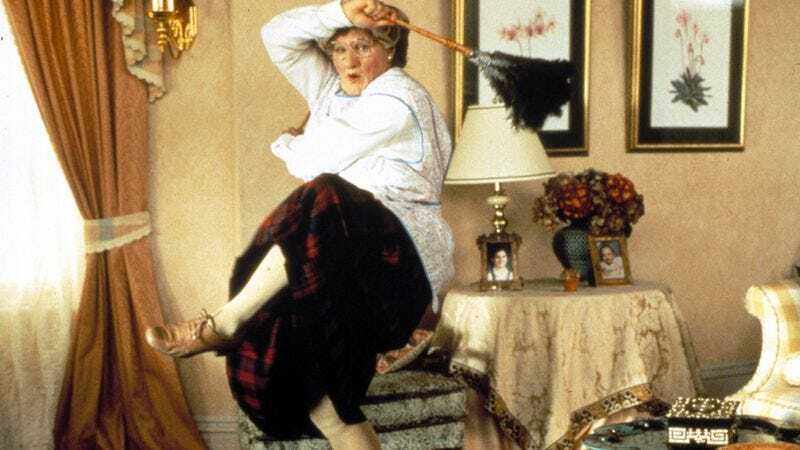 As such, it’s entirely probable that studio executives interpreted Mrs. Doubtfire’s ubiquity as popularity, believing any movie that was well-tolerated enough to act as spackle between syndicated reruns, or as innocuous background noise to hospital patients solemnly going over their living wills, obviously must be ripe for a follow-up. It’s also possible inspiration struck while simply flipping through the channels, as so many a brainstorming session seems to go these days. Unfortunately, the research firm behind the report, IHS Technology, requires a subscription to read what other movies were popular on basic cable last year. (Even though we’ll just go ahead and guess that they were Zoolander, Speed, The Matrix: Reloaded, and Pulp Fiction: Butchered To The Point Of Being Unwatchable Version, based on our own personal research.) But rather than pay to find out, you can probably just wait until the next sequel is announced.